தாங்கள் பெரிய சர்வதேசவாதிகள் என்று பீலாவிடும் மாவோயிஸ்டுகள், கம்யூனிஸ்டுகள் எப்போதுமே படு மோசமான தேசியவாதிகள், இனவெறியர்கள் என்பதை ரசிய புரட்சிகாலத்திலிருந்து நிரூபித்து வருகிறார்கள். இன்றைக்கு சீனாவில் இருக்கும் சீன கம்யூனிஸ்ட் கட்சி - ஹன் சீன தேசிய வாதத்தையே முன்வைக்கிறது என்பது எல்லோருக்கும் தெரியும். இருந்தாலும், ஹன் சீன தேசிய் வாதத்தை முன் வைக்கும் சீன கம்யூனிஸ்டு கட்சிக்கு எச்சக்கலை பொறுக்க தமிழ்நாட்டு ம க இ க , சிபி எம், சிபி ஐ கம்னீஸ்ட் கட்சிகளும், இந்து ராம் சுப்பிரமணிய சாமிகளும் மிகத்தயாராக இருப்பார்கள். அதே இனவெறி இன்று நேபாள மாவோயிஸ்டுகளிலும் வெளிப்படுவது ஆச்சரியமில்லை. பசுபதிநாதர் கோவிலில் பூஜாரிகளாக நேபாளிகளுக்கு வேலை கொடுக்கவேண்டும் என்று இனவெறியை தூண்டி பலனடைய முயற்சிக்கிறார்கள் நேபாள மாவோயிஸ்டுகள். ஏன் நேபாளத்தை சேர்ந்தவர்களுக்கு கொடுக்கவேண்டும் என்று கேட்கிறார்கள் என்று தெரியவில்லை. ஏன் பசுபதி நாதர் கோவில் இருக்கும் தெருவில் உள்ளவர்களுக்கு மட்டுமே அங்கு பூஜாரி வேலை தரவேண்டும் என்று கூட இன்னும் குறுகிய இனவாதம் பிராந்தியவாதம் பேசலாமே? KATHMANDU (Reuters) - Two Indian priests began work on Saturday in one of the holiest Hindu shrines in Kathmandu, a day after they were beaten up by Maoists demanding important religious jobs be given to Nepalis. The two high-caste Brahmins from Karnataka began conducting rituals at the centuries-old Pashupatinath Temple, even as Maoist activists burnt tyres on roads, bringing traffic to a halt on several Kathmandu streets. On Friday, some former Maoist rebels entered the temple as the priests, chosen by the government, were performing a purification ceremony prior to assuming their roles. "It was a deplorable attack by the Maoists," Culture Minister Minendra Rijal said. "We appeal to all to be calm and cooperate with the government in maintaining harmony." For centuries, the priests of the Pashupatinath Temple were picked by shrine authorities from among high-caste Hindus in neighbouring India, with the consent of the king of Nepal. Since Nepal abolished the monarchy and became a republic last year, the government has taken over the task. இந்த இந்திய பூஜாரிகள் பூஜைக்கு முன்னால், உபவாசம் இருந்துகொண்டிருக்கும்போது மாவோயிஸ்டு கம்யூனிஸ்டுகள் உள்ளே புகுந்து இவர்களை அடித்து நிர்வாணமாக்கி, வீடியோ படம் எடுத்திருகிறார்கள். சீன கைக்கூலி எச்சக்கலை பொறுக்கித்தனத்துக்கு வேறு என்ன தெரியும்? 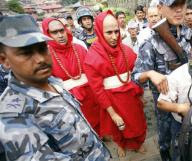 KATHMANDU: The Pashupatinath temple row took an ugly turn in Nepal Friday with a mob assaulting the two newly appointed Indian priests, stripping them naked and tearing off their sacred threads regarded as mandatory for Brahmins. Girish Bhatt and Raghavendra Bhatt, the two newly appointed Indian priests, were brought from Karnataka state in India this month to continue the nearly 800-year-old tradition at the revered Pashupatinath temple in Kathmandu of employing priests only from the orthodox southern states of India. The two hapless men were thrashed within the temple premises Friday as they were readying to worship the deity from Saturday. Eyewitnesses said about eight to 10 men, armed with iron rods, stormed a secret room in the temple where the two priests had been confined two days ago, fasting and undergoing a purifying ritual so that they would be able to undertake the ritualistic worship from Saturday. The invaders broke open the padlock on the door of the room, dragged the two stunned priests out and beat them up. The attackers also stripped the two men naked and forcibly took video pictures. Then, in a final insult to the two priests, their sacred white thread were torn off. The priests wear these sacred threads to proclaim that they are Brahmins and have undergone traditional rituals. "The attackers tried to drag them away," said an eyewitness who did not want to be named. "But the abduction bid was foiled after the people in the temple raised a hue and cry and locals gathered." The two shaken priests have been taken to a safe place, temple officials said. The attack inside the temple comes after protests began Sunday with at least three organisations banding together to oppose the appointment of Indian priests. They have formed a committee to oppose the appointments, saying at a time Nepal is writing a new constitution, Nepali priests should be employed instead of Indians. Though the protesters say they have no political affiliation, locals said the attack was led by the Young Communist League, the dreaded strong arm of the Maoists that had spearheaded a similar attack last year. Both the new priests' appointment and the attacks on them come at a time the row is being heard in court. For the first time in the history of the 5th century temple, the Mahasnan ritual - the ritualistic bath of the deity - is in jeopardy with the priests saying they feared to carry on with their duties in the absence of security. The Indian priest vs Nepali priest row was triggered by the earlier Maoist government last year that sought to stop the old tradition of hiring Indian priests for the Pashupatinath shrine. However, the move raised widespread concern in India with major political parties there asking Nepal not to politicise religion and not to hurt the sentiment of two billion Hindus worldwide. The protestors have said they would keep up a blockade of the Pashupatinath area and take stronger action if the Indian priests are not sent back. Of the five Indian priests who originally served at the shrine, three have already resigned due to the mounting political pressure. Both the protesters and the Nepali government allege that the other side is trying to grab the offerings made at the temple daily that runs into thousands of rupees. இங்கேயும் இந்த கும்பல் இனவெறியைத்தான் முதலில் வைக்கிறது. பார்ப்பனனை தனி இனமாகவும் அவனை ஒழித்துக்கட்டவேண்டும் என்றும்தான் இங்கே வைக்கிறது. அந்த பருப்பு வேகவில்லை என்றால், தமிழ்நாட்டில் இருக்கும் மற்ற மொழி பேசுபவர்கள் மீது இதே கும்பல் வன்முறை வெறியாட்டத்தை ஆரம்பிக்கும்.